While drinking heavily and partying hard, people tend to feel on top of the world. When the next day comes, the effects of all that drinking settle in, and the hangover starts. This is associated with various unwanted symptoms, including hangover body aches and pains. But is hangover pain real, or do drinkers misattribute aches from other factors to alcohol? Can hangovers cause body aches? How can hangover cause body pain? How to cope with hangover body pain? Can one safely use alcohol as a painkiller? What are the signs that emergency care is needed? Does drinking along cause aches in the muscles and joints? In short, yes, hangover back pain and other aches can be part of the standard morning after drinking symptoms. However, not all aches experienced after a night of drinking are directly caused by alcohol consumption. Sometimes they are due to stumbling while drunk, partaking in risky behavior, and other activities that may lead to injuries. Hangover pain may be quite varied. For example, some people experience hangover joint pain in their knees, shoulders, and even hands. Hangover eye pain can be part of the usual night-after-drinking headache. As such, any ache experienced the morning after drinking is potentially a hangover symptom. 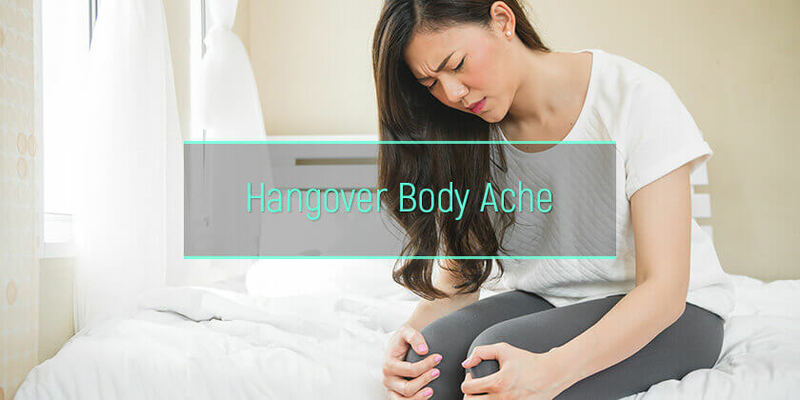 To understand the ways a hangover may cause body aches, it is important to recognize that it is not an exact condition, but rather a collection of symptoms people commonly experienced after drinking heavily, with some people experiencing certain signs more than others. These symptoms can all be traced back to the consumption of alcohol and subsequently the absence of it, including hangover body aches. However, their exact causes may be varied. Here are some ways morning after drinking body aches can be caused. Drinking alcohol does not inherently lead to muscle strain. However, due to lowered inhibitions when drunk, it is not uncommon for people to overwork their muscles when drinking heavily. For example, hangover leg pain is rarely caused by drinking itself; instead, it is usually from things like dancing, running, and partaking in physical activities while not having full bodily control. This type of body ache is similar to that felt after a difficult workout. Those who are not usually physically active are most prone to this type of ache. Drunk people often end up sleeping in uncomfortable positions. Sometimes this is because the drinker passes out, but it may also happen when sleeping on couches at other’s homes or just because the person did not take care to get into a comfortable position when going to bed. Hangover neck pain, for example, is associated with poor sleep positions. Drunk people are much more likely to injure themselves than those who are sober. Incurring an injury when drunk is not directly part of having a hangover. However, due to the numbing effects of alcohol, the drinker may not feel aches from the injuries until the next day. As a result, they are associated with the general morning after drinking effects. This could be highly problematic, as sometimes the injuries are quite severe, but when the drinker believes them to be part of the general morning after drinking effects, they delay seeking help. According to a study published in the Journal of Strength & Conditioning Research, consuming alcohol can delay muscle recovery after physical activity. In the study, they looked at muscle recovery in rugby players who drank heavily after a game. However, this is not unique to athletes. Additionally, alcohol has been found to make it harder for the body to break down lactic acid, which contributes to general muscle aches. Anyone who strains their muscles before or during a bout of heavy drinking should expect that their muscles will take longer to recover than they would in the absence of alcohol. Heavy drinking is associated with dehydration. In turn, dehydration can cause muscle aches and other types of body ache. The pains associated with dehydration as a result of drinking are wide-ranging. Hangover sinus pain may be the result the sinuses becoming too dry. Neck pain with a hangover can be from a lack of lubrication in the joints. Other symptoms may exacerbate being dehydrated. Vomiting after drinking can cause the body to lose a significant amount of water. The more the drinker throws up, the worse the dehydration will become. Diarrhea from hangover may also contribute to dehydration. Even sweating as a result of alcohol consumption may cause dehydration. This is why drinkers need to know how to stop alcohol sweats. Ultimately, many aches and aches associated with drinking are caused, at least in part, by dehydration. Alcohol itself can be thought of as a toxin; when consumed, it alters the natural processes of the body, and when it is drunk in large quantities, it can cause poisoning. However, drinking it can also cause the body to release toxins it naturally produces in greater amounts than normal. For example, it can cause the pancreas to release toxins into the blood stream, causing aches in the muscles, joints, and even organs. At high levels, it can lead to organ failure. Alcohol can have a significant impact on the organs, and this is often felt as pain after drinking. Since the liver processes alcohol, it can experience aches after heavy drinking. The kidneys also can become tender due to dehydration caused by drinking. Even hangover heart pain can occur. Often, organ pain is confused for other types of aches as it can radiate out from the source. A hangover-causing pain on the left side of the body could be referred from the liver or kidneys. The same is true of lower back pain from a hangover. There is perhaps no ache more widely associated with hangovers than head pain. This is caused by vasoconstriction—when the blood vessels have expanded due to the effects of alcohol and rapidly constrict in its absence. Depending on the severity of the headache, it can be felt as flu hangover head pain or something much worse. When people experience their worst hangover, it is usually one that includes migraine-level agony. Vasoconstriction can cause pain throughout the head, face, and neck. A back of head pain hangover is the result of constricted blood vessels. Even tooth pain after a hangover can be due to the blood vessels contracting. This is why many drinkers worry about how to cure hangover headaches. Supposed cures abound both online and in real life, but do they address body aches? To date, no scientific study has found any of these so-called cures to be effective at easing the pains associated with drinking, with the consensus being that, at best, users may experience a placebo effect. What can help with body aches and pains after heavy drinking is pain medication. The best pain reliever for hangover pain will be non-steroidal anti-inflammatories; aspirin and ibuprofen fall into this category. Acetaminophen should be avoided at this time. This is because it is processed by the liver, the same as alcohol, and consuming both at the same time or in quick succession can amplify the toxic effects of both substances. So, even if Tylenol is what one would usually use, it is not the best pain reliever for a hangover. Feeling sick the morning after can make people desperate to fix their problem. One of the most commonly noted ways to cope with a hangover is colloquially referred to as “hair of the dog.” According to those who use it, if one drinks more the morning after binge drinking, they can eliminate the effects, including common aches such as neck pain with a hangover. However, drinking more does not cure a hangover. It can dull the senses so that discomfort is not felt as acutely, but it does not stop it, and once the alcohol wears off once again, the symptoms can come back stronger. Additionally, attempting to use alcohol as a painkiller can amplify other hangover symptoms. Alcohol-induced shakes during hangover can escalate to the point that the individual loses proper motor control. Vomiting and diarrhea may become more prolific. Even alcohol fever might set in. It is important that all drinkers understand that when they are experiencing the morning after drinking, more alcohol is never the answer. If any of these symptoms are observed, the drinker or those around them should head to the nearest emergency room to seek treatment. Experiencing symptoms after drinking is never pleasant, but if someone is frequently drinking to the point of having a hangover, it is a sign of a larger problem. Anyone dealing with alcohol dependence and abuse should seek out the rehabilitation that can help them get clean. Ultimately, there are worse effects from drinking than a hangover. Getting treatment now can be lifesaving.